I have been watching Intel for a few years now. I have never purchased their stock although I was very tempted during the market meltdown in late 2008 when it was trading around 11$. I instead stuck to the faithful Canadian Banks. Intel, like many others, got back to their pre-market crash levels and recently it has come down slightly hitting near their 52-week low.As you probably know, Intel is a leader, if not THE leader, in the computer chip industry. In this day and age, everyone probably owns a device with a computer chip and if you include your office, chances are you are using an Intel chip. At today’s price of 18.12$, Intel yields 3.53% which can be compared with Johnson & JohnsonNYSE:JNJ and General Electric NYSE:GE where they each respectively earn 3.68% and 3.11%. Let’s have a look at their data. Market Capitalization of 100.89B$. It definitely falls in the large-cap category but it is still 60B$ short of the JNJ, GE and IBM market capitalization. However, Intel’s direct competitors are nowhere near the same size. A current P/E of 10.85 which is relatively low for a technology company. Google, Apple, Oracle or Yahoo all trade around a P/E of 20. IBM and Microsoft are trading around 11. Even GE and JNJ have a higher P/E at the moment. Intel has paid dividends since 1992. Not a dividend aristocrat yet but you got to start somewhere. That’s 18 years of dividends with 14 of them growing the dividends. Estimated dividend payout ratio of 39% for 2010 with a 5 year average of 48%. The primary competitor to Intel is AMD in the personal computer landscape now that Apple dropped the PowerPC chip from IBM / Motorola but there are others making computer chip for handheld devices. However, I would not buy the computer chip competitors personally. They do not fit in my portfolio. I would prefer to compare them with other leaders in the technology industry such as IBM, CSCO or MSFT. IBM and Microsoft have a dividend yield just above 2% and Cisco doesn’t pay dividends. These companies are more about providing growth and this is what makes Intel interesting as it can provide growth while paying a decent dividends with ‘some’ historical growth. Would you not want to own a share of a company that everyone is becoming dependent on? Just like Cisco owns the networking market, Intel owns the chip market. Just like Moore’s Law dictate that the number of transistors we can put on chip will grow exponentially, we can assume that our software requirements will continue to request faster computers and therefore create a continuous demand for computer chips. 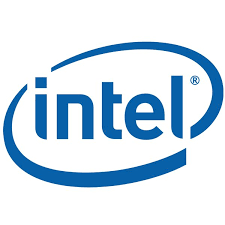 It may be a company in the technology sector, usually seen as more risky, but there certainly is some comfort in knowing we have become dependent on computers to continue to generate a demand for Intel’s products. 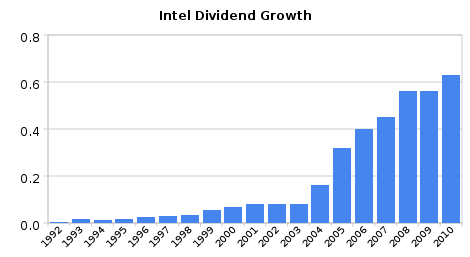 Intel is certainly a growth investment with the upswing of a good dividend yield. I am seriously looking at it at this price. An investment just a little over 2000$ would DRIP 1 share per quarter. Readers: Do you believe a company in the technology sector can be a dividend investment?